Articles on the theory or philosophy of AI/Neuroscience/Cognitive Science, etc. Futurist or random number generator? I think he might be right that we can simulate the brain before we understand it, however. Jonathon Keats (no, not that one) has written a scorching review of neuro grad student Jonah Lehrer’s new book, Proust was a Neuroscientist. I saw this somewhat more favorable review a few weeks in the NYT and was intrigued by the book. As an undergrad, I majored in cognitive science and English and, naturally, was fascinated by the cultural differences of academics in these disparate fields. As in the Salon article, I also think attempts to unify the “two cultures” (ie. arts and sciences) are misguided. A work like Lehrer’s book (which I have not read) will need to work hard to “prove” its thesis and likely sound very forced. What can we really say about arts vs. sciences? For that matter, is it important to make value judgments on this topic? I’d say, no. We seem to have a natural urge to categorize our activities and then try to order them. Science is more worthwhile. Art is a more creative endeavor. Are these blanket generalizations productive? But there is overlap between the two cultures and those regions seem more and more important to me. And I think neuroscience in particular has a lot to say here, too. If we know what makes good art good (in a scientific way), will we stop appreciating it or enjoying it? (This is similar to the idea that if someone told you free will was simply an illusion would the illusion be any less powerful than it is right now?) Often, the surprise of creative thought underlies the best science and the best art. Okay, there’s my attempt at a unification! On a separate note, there certainly seems to be a hunger amongst the reading public for neuroscience books, despite our incomplete picture of how the brain works. For those frustrated with slow progress in research, maybe we should just go write a book. […] But just by looking at the brain itself, will you ever be able to understand the creative mind? PINKER: I suspect not. In fact, the reason I’m not a neurobiologist but a cognitive psychologist is that I think looking at brain tissue is often the wrong level of analysis. You have to look at a higher level of organization. For the same reason that a movie critic doesn’t focus a magnifying glass on the little microscopic pits in a DVD, even though a movie is nothing but a pattern of pits in a DVD. I think there’s a lot of insight that you’ll gain about the human mind by looking at the whole human behaving, thinking and reporting on his own consciousness. And that might be true of creativity as well. It may be that the historian, the cognitive psychologist and the biographer working together will give us more insight than someone looking at neurons and brain chemistry. I think the analogy with the DVD is disingenuous. In the case of the DVD, we know precisely how the low-level pits are combined to form the high-level representation (the movie). The system is not mysterious. To be fair, Pinker doesn’t say that neurobiology is always the wrong level of analysis. Maybe he would have been correct 50 or 100 years ago, but I think it’s clear now that neurobiology is on the path to providing a complete synthesis (certainly, with the help of cognitive psychology) that cannot be achieved without it. 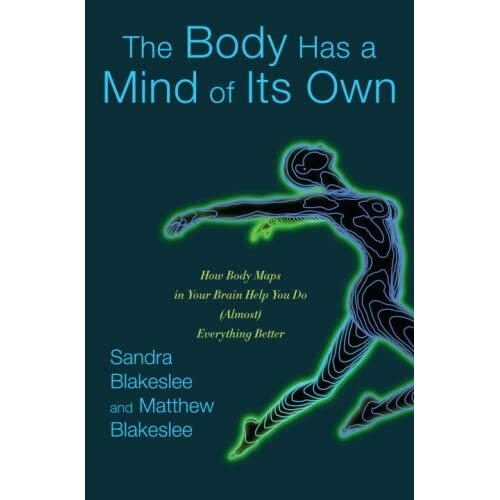 The maps that encode your physical body are connected directly, immediately, personally to a map of every point in that space and also map out your potential to perform actions in that space. Your self does not end where your flesh ends, but suffuses and blends with the world, including other beings. […] Your brain also faithfully maps the space beyond your body when you enter it using tools. Take hold of a long stick and tap it on the ground. As far as your brain is concerned, your hand now extends to the tip of that stick. […] Moreover, this annexed peripersonal space is not static, like an aura. It is elastic. […] It morphs every time you put on or take off clothes, wear skis or scuba gear, or wield any tool. […] When you eat with a knife and fork, your peripersonal space grows to envelop them. Brain cells that normally represent space no farther out than your fingertips expand their fields of awareness outward, along the length of each utensil, making them part of you. What I appreciate about this, besides the stretchy comic book characters that it makes me think about, is that it provides a powerful perspective to begin piecing together a mass of disparate neuroscience data, which the Blakeslee’s capitalize on.